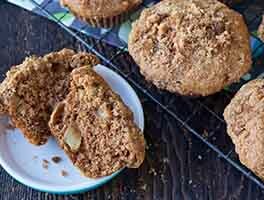 These moist muffins, made with sorghum flour, rise nicely. They're delicious split and served warm, with apple preserves or cinnamon-sugar and butter. 24 mins. to 28 mins. 49 mins. to 1 hrs 3 mins. Preheat the oven to 375°F. 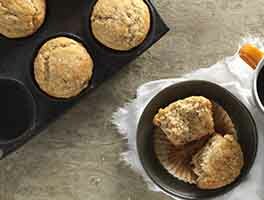 Grease a 12-cup muffin pan, or line the pan with muffin papers, and grease the papers. Whisk together the the flours, flax, sugar, salt, cinnamon, baking powder, and xanthan gum in a large bowl. Whisk together the melted butter or oil, eggs, and buttermilk. Add the buttermilk/egg mixture to the dry ingredients, whisking until everything is well combined. A few lumps are fine. Gently stir in the chopped apples and nuts and/or raisins. Scoop the batter by the generous ¼-cupful into the prepared muffin cups; a muffin scoop works perfectly here. Sprinkle the tops with coarse sugar, if desired. Set aside to rest for 10 minutes. Bake the muffins for 24 to 28 minutes, until a center muffin feel set when pressed lightly in the middle and is lightly browned on the edges. 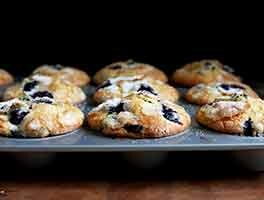 The tops of the muffins won't change color much. Remove from the oven, and let sit for 5 minutes to firm up slightly before tipping out of the pan onto a rack to cool. 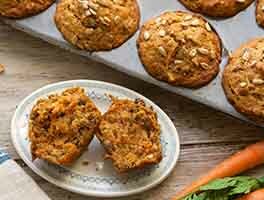 These muffins are very lightly sweetened, designed to be a suitable base for sweet preserves and spreads. 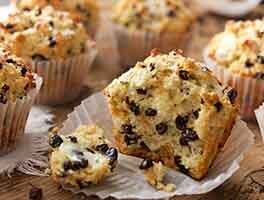 For more sweetness in the muffins themselves, add raisins rather than nuts. After reading the reviews about the recipe not providing enough flavor, I decided to add some of my favorite flavors. I added 1/4 cup dark brown sugar, 1/2 teaspoon cinnamon, and one whole, unpeeled apple, coarsely chopped in the food processor. I followed the recipe according to directions with my additions and they were absolutely delicious and I will definitely make again and again. Next time it will be raisins and carrots. 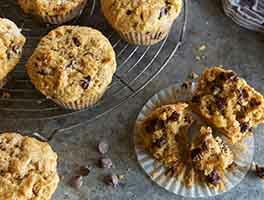 I recommend this GF muffin recipe as a platform for your favorite flavor combinations. With high altitude adjustments, these muffins baked well. I agree with the previous reviewer though; they are tasteless and not at all sweet. I love K. A. GF mixes and the muffin mix that i make regularly. I had high hopes for this recipe but it was tasteless and not at all sweet. I followed the recipe to the letter, with the exception i didn't grease the muffin paper cups. The paper afterward couldn't be peeled off but that was my error. I wouldn't make these again or i would up the sugar. Probably the best GF baked good I've made from scratch. Great texture. I did make a few subs since I am also doing no dairy & no refined sugar. I used 1/8 C Agave nectar (will prob up it to 1/4 C next time) & used Almond Milk instead of buttermilk. I did not use nuts or raisins since my daughter doesn't like either. I used a food chopper & minced the NON peeled apples down but stopped before I made apple sauce. You can't tell the peel is in there when it's chopped finely. I WILL make these again. And will probably sub PINEAPPLE in for a twist.